The phrase “democratic values” will remain. So will teachings on Harriet Tubman, gay rights, climate change and Roe v. Wade in the latest draft of social studies standards for Michigan public schools. The revisions, posted Tuesday on the State Board of Education agenda for its April meeting, follow public uproar over an earlier, conservative-tilted draft that would have changed how some history would be taught in state classrooms. The new draft will be presented to the State Board of Education at the board’s meeting April 9, where it will likely receive a positive reception from the Democratic (big D) majority board. The public will have an opportunity to comment on the revised standards, both online and in a series of public meetings. The new draft is the latest attempt in a four-year slog to update Michigan’s social studies standards ‒ something that is done in all subject areas on a regular basis. The Michigan Department of Education unveiled a draft of revised social studies standards in Spring 2018 that was influenced by then-Sen. Patrick Colbeck, R-Canton Township, and a cadre of fellow conservatives who helped rewrite the standards that were to be used in kindergarten through 12th grade. A public uproar followed a Bridge article detailing the changes. 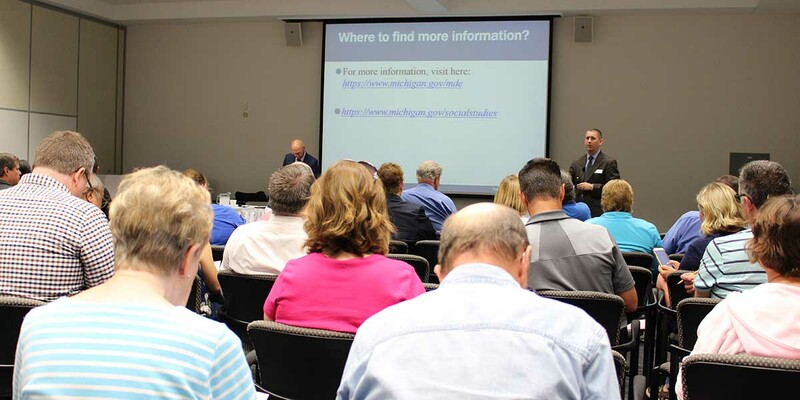 The education department held 18 public meetings around the state in 2018, in which the vast majority of comments, according to education department officials at the time, were critical of the proposed revisions, which critics said were politically motivated. The Colbeck-influenced draft almost immediately faced headwinds at the State Board, an elected body that in the summer of 2018 was split evenly between Republicans and Democrats. Standards revisions need to be approved by a majority of the board, and the Democratic members vowed to oppose the draft as written. After elections this past November, the board is now Democrat-majority, with two new Democratic members saying in their campaigns that they opposed the 2018 conservative-leaning draft. You can compare the conservative-influenced 2018 draft to the new version here. The 2018 version had one reference to Martin Luther King, Jr. The new version has four. The 2018 version cut a reference to Roe v. Wade, the Supreme Court decision that legalized abortion; the 2019 draft has two references. A reference to gay rights as part of a discussion of civil rights was restored in the new draft. There are six references to climate change in the new draft. In the 2018 version, the only two references were cut. “I have not had a chance to do a deep dive into the updated standards, however, from what I have seen, I believe that they are a vast improvement over what was previously presented to the board,” State Board President Casandra Ulbrich, D-Rochester Hills, said in an email to Bridge. “This process was much more inclusive and took into account many perspectives,” Ulbrich wrote. Standards are state guidelines for what is to be taught at each grade level; specific curriculum (i.e., how topics are covered, which textbooks are used, etc.) is set at the local level. Colbeck was part of a committee that reviewed the draft standards released last year. He said then he hoped to remove partisanship from the standards. No Democratic legislators or activists were on the committee. Colbeck is not listed as a participant in the creation of the current draft. Lindsay VanHulle contributed to this report. So, your unspoken suggestion would be to avoid travel to Brunei? That's so helpful of you. And to help you out in getting to know Rashida Tliab, here are some good places to start - https://tlaib.house.gov/ https://en.wikipedia.org/wiki/Rashida_Tlaib https://foreignpolicy.com/2018/12/11/saudi-arabia-declares-war-on-americ... Or you might try actually communicating with her. You know, like write her a letter with any concerns you might have? This whole thing is so sad because it is so one sided toward the Democrats. How can that be fair and balanced. We need to have a State Board of Educaton that is balanced. It is to bad the left doesn't care enough about our kids to encourage the big picture instead of their narrow one sided views. We NEED to come together and work together to give our kids a balanced education so that they can make up their own minds instead of being brainwashed like they are in most public colleges. THIS IS SAD!!!!! Home schooling is the ONLY way to go if you want your kids to get a balanced education.